Newmont's low costs are good, but lower costs are even better. With the election of Donald Trump, the big question for gold investors is whether the uptrend that started earlier in the year is still intact, or the steep precious-metals decline following election results is the new normal. While investors and miners probably can't predict that future, they can focus on one thing that's key to profitability -- costs. 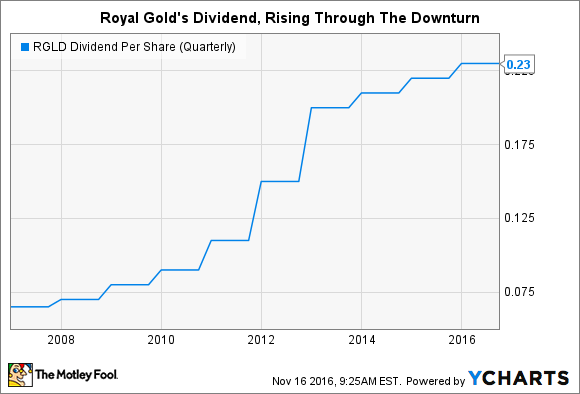 Newmont Mining (NYSE:NEM) is doing a great job on that front, but streaming-focused Royal Gold, Inc. (NASDAQ:RGLD) might be even better. A Newmont gold bar. Image source: Newmont Mining. Digging gold and silver out of the ground is an expensive process. Miners first have to find a good place to dig. With any luck a miner finds enough precious metals to make the often years-long effort and expense of building a mine worthwhile. And then, over time, the cost of running a mine usually increases, making it less and less profitable to operate. It ends up being a vicious cycle, with miners always on the lookout for new mines to make up for their older, more expensive ones. It's a constant struggle to keep costs in check. And when precious-metals prices are high, miners sometimes take their eyes off the ball, letting costs creep up. For example, Newmont Mining's all-in sustaining costs, a measure of how much it costs to pull an ounce of gold out of the ground, were $1,170 per ounce in 2012 when gold prices were higher. In 2016, chastened by lower gold prices, the miner expects to trim its all-in sustaining costs to as low as $870 an ounce. Newmont Mining portfolio changes. Image source: Newmont Mining. Those figures, however, exclude a mine called Batu Hijau that Newmont recently agreed to sell. What's interesting about this is that the sale is an example of the company's recent effort to focus on its best assets, so that it can keep costs in check. In fact, the miner has agreed to sell, or has sold, five mines recently. The average remaining reserve life of these mines was less than five years, and the costs were in the range of $800 to $900 an ounce. The company has reinvested in mines with remaining lives of more than 10 years and costs of below $700 an ounce. So you get the idea: Newmont is working hard to make sure it controls the part of the gold business it can -- costs. On that score, Newmont has done a fine job. But what if there was another investment option where low costs are pretty much built into the model? That would be Royal Gold, which is a streaming and royalty company, not a miner. Essentially, Royal Gold gives money up front to miners for things like building new mines, expanding projects, or just shoring up balance sheets. In exchange for that cash, miners agree to sell precious metals to Royal Gold at reduced rates in the future. It's a good deal for both companies, since miners can avoid issuing dilutive stock, selling bonds, or dealing with stingy banks. And Royal Gold gets to buy gold and silver at often great prices. For example, in 2015, when gold prices were in the dumps, Royal Gold inked a $610 million streaming deal with Barrick Gold (NYSE:GOLD) in which it will pay 30% of the spot price for gold and silver up to set production targets and, thereafter, pay 60% of the spot price. Basically, Royal Gold locked in a profit on the gold and silver it buys as a result of the Barrick deal. The price of the precious metals don't matter; high or low, Royal Gold makes a profit. Every agreement the company makes is pretty much like that, though the actual prices paid for the metal vary deal by deal. The takeaway is that Royal Gold's business model is low-cost by nature, and it doesn't have to deal with any of the mining issues (like rising costs over the life of a mine) that a miner does. RGLD Dividend Per Share (Quarterly) data by YCharts. There's no way to predict the price a precious-metals company will get for the gold it sells. But if you focus on companies that keep their costs as low as possible, you'll be in a better position as an investor. On that score, Royal Gold stands out, because its entire business model is based around low costs. If you are looking for a precious-metals company that can withstand tough times and do well in good times, Royal Gold needs to be on your short list.